Bolton studied and reproduced data from the session book of Aghadowey in Ireland, locating the Irish residences of immigrants and included drawings of the houses. (A copy of the session book in the NEHGS collection may be searched here.) He provided sources for many of his assertions in footnotes, so that readers can look for the original source material. The appendices include a list of ships arriving in Boston area ports from 1714 to 1720, members of the Charitable Irish Society in Boston, and the names of fathers in Presbyterian parish registers from 1730 to 1736. Illustrated with portraits, maps and views of buildings and landscapes, this enduring study of the earliest mass migration of the Irish to America remains an important source for twenty-first-century researchers. 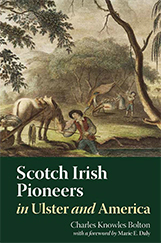 Adapted from the foreword to the NEHGS edition of Scotch Irish Pioneers in Ulster and America. 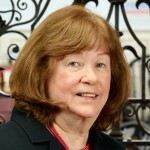 Another resource for 18th century Irish immigration is Trade in Strangers, by Marianne Wokeck. It’s largely about the German immigration, but it also has a good section on the Irish. It’s how it worked as an economic enterprise with fascinating details of the development from sporadic and experimental to efficient and profitable. Does anyone know of any early resource material for Irish arrivals in NH, specifically Portsmouth NH? I have been trying to flesh out information about the travel of a family supposedly arriving in the Rye, Portsmouth area in about 1721 from Londonderry. I’ve never been sure if ships DID actually bring people there, or if all immigrants entered through Boston first, THEN moved north. I imagine that the ease of the coastal waterways in the 1700’s was somewhat like our interstate system for connecting ports.